Sierra Trails invites all the adventurers who love to sit on horseback to take part in this horse riding holiday in beautiful country, Spain. With its rich variety of landscapes and consistently beautiful scenery, Alpujarras and the Sierra Nevada mountains offers some of the most spectacular horse riding countryside in Europe. You will ride through breathtaking trails to Mulhacen, Trevelez, and Bubion. Riding through these ever changing landscapes will be an unforgettable experience for you. Find the amazing horse riding holiday with Dallas Love! You will be accommodated at Casa La Sevillana on day one, two, four, and five. The place was formerly the rather splendid residence of the local manager of the national electricity supply company, Sevillana. When electricity supply was denationalized in Spain and assets were sold off, the family bought the house, renovated it throughout, and converted it into comfortable and attractive bed and breakfast accommodation in the dramatic setting of the Poquiera Gorge in the Sierra Nevada Mountains in an area known as Las Alpujarras. The views are breathtaking, snow-capped peaks in the immediate north and towards the Mediterranean Sea in the south. You can even see the Rif Mountains of Africa if conditions are right. Set in the small, ancient, white-washed village of Bubión, Casa La Sevillana is conveniently placed a few minutes away on the country road which winds up the gorge to Capileira, one of Spain's highest villages. This is a perfect base for you who love mountains and nature. An intricate network of paths and tracks at all levels will satisfy walkers of every ability and inclination and there is one of Spain's finest stables very close by (the owner lives in the village). Local facilities are excellent. There is ample free parking. Shops, bars, and restaurants are a stone's throw away. You will be staying at La Fragua on day three. Those of you who have arranged to be collected from Málaga Airport (AGP) can be pickup at the pre-arranged time and driven to the village of Bubion - just over a two-hour drive. While in Bubion, you will be staying at comfortable Casa La Sevillana. Your host (Dallas Love) will meet you at 20:30 and take you for dinner at one of the local restaurants within an easy walking distance of your accommodation. After breakfast, you will be driven the five-kilometer up to the stables where you will meet the horses. The ride will vary slightly depending on the weather and the time of year. You will then ride an average of six hours following the acequias (ancient Moorish irrigation channels), old bridle paths, and tracks through the valley Poqueira to the base of the Mulhacen at 3,486 meters - the highest mountain on the Spanish mainland. Full picnic lunch will be en-route. You will return to Bubion for your second night. Today, you will ride to the whitewashed village of Trevelez, the highest village in Spain and famous for its air cured hams. During the morning, the old bridle paths wind their way through chestnut woods, orchards, and terraces above the villages of La Taha. After picnic lunch, you will join the main forestry track through the pine woods. Here, there are opportunities for some nice canters. The final descent into the village will be on a narrow path and it is necessary to lead the horses for 15 minutes. Trevelez still has cattle and sheep. The cattlemen and their horses heading out to the hills is a common sight in the early morning and late evening. Overnight will be at a hotel - La Fragua, dinner at the local restaurant. Today, you will enjoy five and six hours of riding, approximately 28 kilometers. Returning to Bubion, you will follow the forestry track and then the Sulayr path through oak woods and open pasture lands high above the village. Picnic will be at 2,300 meters with stunning views over the Mediterranean, the valley of Trevelez, and the foothills of the Contraviesa. During the afternoon, you will leave the open pasture lands behind and follow the path descending through pine woods to the stables. Farewell drink will be in the village of Bubion and overnight will be at Casa La Sevillana. Today, you will enjoy six hours of riding, approximately 25 kilometers. After breakfast, you can be transferred to Málaga Airport (AGP) at the pre-arranged time. With more than 30-year knowledge of this region, Dallas has chosen a selection of trails offering an amazing diversity of terrains, views, and flora. The rides will follow ancient bridle paths and drovers' routes, dating back to the Moorish occupation and before. Many of these paths have been in use for a thousand years or more as have the terraces and irrigation channels they transverse. Through parts of the mountains, there are more recent dirt tracks providing opportunities for canters and gallops as do some of the river beds on the spring and autumn rides. The paths, in many places, are built into the rock and it is necessary to lead your horse on some of the steeper descents. Likewise, it is necessary to lead the horses through the narrow village streets. Here, it is possible to forget the pressure of daily life and to ride all day, meeting only the occasional shepherd or farmer. The horses are purebred Andalucian (PRE) and Andalucian Arab or sports horse crosses ranging from 14.3 to 16.1 hands. Some of the horses are home bred. Others came as youngsters and most of them stay with Sierra Trails for life. They have been carefully selected for their good natures (a trait of the Spanish horse) and endurance. The horses are fit, happy, and strong. They enjoy their work and are a pleasure to ride. These are not the average riding school or trail horse but well-bred and schooled horses, responsive, and fun to ride. One of the most frequent comments from riders is that the quality and schooling of the horses far exceeded their highest expectations. They lead a happy and healthy life, working hard when needed and free to be horses in a herd when not working. During the season, they work one week on and one week off. As a result, they are not sour, enjoying their work and being with people. When bringing in new horses, ideally Sierra Trails prefers for them to be unbroken and unhandled so ensuring that they are correctly started. This initial contact and ground work is essential for a good future working relationship with people. Most of the horses have been started, backed, and schooled by Mordecai. There are selections of horses to suit different riding levels and great care is taken in the selection of horses according to the riding abilities and preferences of each individual. Sierra Trails keeps about 22 horses and each one has its own personality which is special in its own way. Knowing very well their different characters is essential in matching the horse to rider. Nearly all the horses have a basic training in classical dressage. They are light, responsive and forward going. These rides are suitable for competent to experienced riders. In order to participate on the ride, it is necessary that you can control a horse outside at all paces and that you can mount and dismount without assistance. Meanhile for fitness, you will need to be reasonably fit to participate on the rides. In addition to being riding fit, you will be required to lead your horse on some of the steep descents and need to be comfortable walking on rough ground. There is a weight limit of 90 kilograms. Dallas owns the longest established holiday riding center in the Alpujarra. Since 1987, her top quality Spanish horses have provided unforgettable holidays for hundreds of people. The week rides and much of the short breaks are led by Dallas. Working with horses most of her adult life, she established the first stables in the Alpujarra and now has more than 20 horses. The horses have been backed and schooled by Dallas and her brother Mordecai Love, a professional dressage trainer. Many of the horses have a basic training in classical dressage. The horse riding holiday will cover several places in Andalusia, Spain including Mulhacen, Trevelez, and Bubion. The stables are situated in the spectacular valley Poqueira, above the picturesque villages of Pampaneira, Bubion, and Capileira at 1,650 meters. They are possibly the highest stables in Europe just over an hour drive to the coast, an hour and 15 minutes to Granada, and a little over two hours from Malaga. The Sierra Nevada covers an area of approximately 2,000 square kilometers in the provinces of Granada and Almeria in the south of Spain. Sierra Nevada National Park covers 86,210 hectares and another 86,000-hectare natural park, making it the largest park in Spain. With more than 20 peaks over 3,000 meters, it forms the highest mountain range on the mainland. The many microclimates have given rise to the richest botanical life in Europe. 2,100 plants have been cataloged in the park and 60 of which are unique to the area. You will be served breakfast, lunch for three days, and dinner in the night of arrival. The food is fresh local produce. The area is famous for its air cured hams, cheese, and trout. A special effort is made to enable the visitor to sample the different local dishes, ordering what each place cooks best. Please specify if you have any special dietary requirements. Please book your flight to arrive at Malaga Airport (AGP) or Federico García Lorca Granada Airport (GRX). Transfer from and to this airport is available upon request. Sierra Trails can arrange a collection from Malaga Airport (AGP) or Federico García Lorca Granada Airport (GRX) for an additional cost of 35 EUR per person each way. The collection time should be no later than 4 p.m. and the return transfer on the day of departure would get into Malaga earlier than 10 a.m.
Airport: Federico García Lorca Airport Airport transfer available: Federico García Lorca Airport (US$39 per person) Additional charges may apply. You can request this in the next step. Airport: Málaga Airport Airport transfer available: Málaga Airport (US$39 per person) Additional charges may apply. You can request this in the next step. 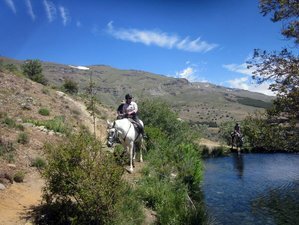 Sierra Trails offers short breaks, and week-long horse riding holiday through the national and natural parks of Sierra Nevada. Quality PRE Spanish horses.